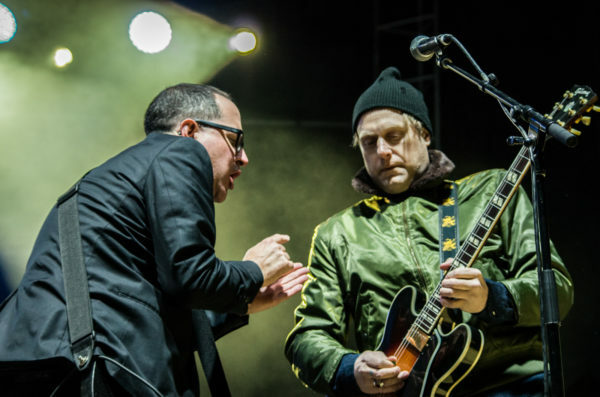 Saturday’s Surlyfest show certainly felt like a homecoming for the Hold Steady, and it felt a bit like one for myself as well in on-again, off-again relationship with the quasi-local group. A gigantic fan during the band’s first three albums, I had joined the ranks of cynics over the last half-decade or so as the band lost much of their mojo. But something about playing outside behind the Surly brewery seemed like a good chance to jump back into the fold, and aided by some Surly beer, it proved to be a good decision. The band played a 90 minute set that leaned heavily on their first three records to a decent sized crowd who were braving an unusually cold fall night. Starting with “Stuck Between Stations,” the band played a a 24-song set that somehow didn’t feel overdone. (Again, maybe the beer.) Not overthinking things, they played crowd favorites “First Night,” “Sequestered in Memphis,” “Your Little Hoodrat Friend” and “Massive Nights.” The four song encore ended with stirring takes on “Stay Positive” and “Killer Parties,” sending the crowd off into the cold night with a warm buzz. Craig Finn’s songs are in many ways about the stories of youth under the shadow of getting older, and the crowd certainly seemed to be of the demographic that understands those challenges acutely. Despite a older crowd, the energy was high for the show up near the state (there were groups in the back who seemed wholly disinterested) in a way I think showed that there is always a home in Minnesota for this band and these songs. The group played two shows the next day in the Entry that I’m sure had a different vibe, but at this point The Hold Steady seem to me to be a great “drink beer outside and listen to music” band. Not sure if I’m fully back in the fold, but Saturday night felt like a good reminder that things that once had a spark probably always will, even if it isn’t as vibrant.